Hello! Today when I loaded up the game I noticed that one of my train-convoys didn’t load goods. It’s stuck at 0%/100%. The connection is Refinery to ”Daily Goods Factory” (I don’t know the english name, I have set the game to swedish) which transports plastic. The refinery has connections to both Car Factory and ”Daily Goods Factory” and it feels like the Refinery doesn’t produce anything to the ”Daily Goods Factory”. (In the Refinery’s list of consumers the ”Daily Goods Factory” is connected. The convoy from Refinery to Car Factory works properly. I hit Shift+P and built a new Refinery, and manually connected it to the ”Daily Goods Factory” and it did not load anyway... What should I do? ”Daily Goods Factory” - in swedish: Dagligvarufabrik. Please correct me! Which pak set are you playing? If the game is running in JIT2 mode then try the latest nightly. Some older versions have a bug where under highly specific conditions it is possible for production state to become bugged. I play in .pak128 but I don’t know where to check that JIT2 thing. If you don't know have to check it, you will most likely not have changed it either. So what is my problem? Should I upload the game-file? I have another question also, how to disable the ”Load with add-ons?” Dialogue? I don’t understand what to do... I have add-ons to get metro/subway/underground train to stop at stations. _ The refinery is a supplier of the daily goods factory: that means that in one factory's window there is a link to the other. _ At each factory, the station can accept goods: a good mini icon (in pak128 it looks like a lump of shi...something) is displayed in the station's windows. If it cannot, you just have to add one building which is able to accept goods to your station (a building which has the same icon on its toolbar button). _ Your train can transport plastic, which is of the category "piece goods" (or something like that). If you don't find the problem, please upload a screenshot with your convoy, the window of each factory and each station opened. _ Refinery is linked to the Daily Goods Factory. 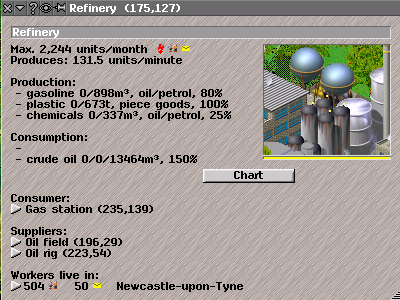 _ Refinery has oil in stock, but all of it is reserved for the Car Factory. _ Daily Goods Factory is empty. (It has caused that export-trains stopped). _ All stations is properly placed, the train finds a route. _ My train: (.pak128) Marks-Deltic (diesel) x2 and RVg_1994_container_car x8. Of what should I upload a screenshot of? The lump of ... we're gonna say "coal" if that's okay , should appear in the arrival station (see attached picture), otherwise it means that the station cannot accept goods. By the way, check that your station is correctly built so it's one station. Recently we had a case of a station that was in fact two different stations (see second attached picture), it may happen if the station was not correctly built. That trains find a route is not what makes a station properly placed. Check that the station is listed in the corresponding factory information window. The list is at the bottom of the window. There is the lump of... coal in both stations, refinery and daily goods factory. And, there’s only one station (same name on all ”platforms”) at each factory. 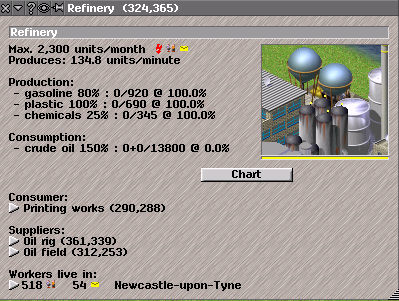 Yes ters, the daily goods factory is listed as a consumer in the refinery and the other way. I can click on the arrow and it takes me there. It is connected. And at each factory the station is connected and listed. I uploaded this about the refinery and the daily goods factory. Sorry but the names are in swedish, I changed system language to english so you could understand better! Was it so easy?.... So then, can someone explain to me what all of those numbers mean, please? In your case, for plastic, x > z so the factory stoped ordering plastic (=> y = 0). As Turfit pointed out, your factory needs steel now. But anyway, thanks guys for helping me. I’ll mark this thread as solved now. x/y/z descriptions should be included in help. I think they are not. That might be difficult, as the numbers changes meaning based on JIT setting, but the help text does not. Above meanings are for JIT1, I guess (default in pak128). What are their meanings in JIT2 (besides of different formatting)?